UV Layers - How do they work? on how to make use of UV layers. Does anyone know of any good tutorials on this? Or can you explain it briefly? how do I make use of another UV layer? is it at all similar to layers in Photoshop? :spin: Am I making sense or is this too wordy? <—Don’t answer that one. hug them…more than once…but less than 5 times. P.S: For real though, no hugs. “UV Layers” has nothing to do with actually layering imagery or colors as it does in Photoshop. “UV” refers to the set of coordinates that map a 2D image onto 3D geometry. So, when you hear people talk about “I UV mapped this model” what they mean is that they assigned UV coordinates to the model, and then used the regular material and texturing tools to assign an image map, and it was set to use those UV coordinates, as opposed to one of the other methods (orco, global, etc.). The ability to create different “UV Layers” has little to nothing to do with how your textures will blend and work together to produce a final material. Adding additional UV layers is just creating new sets of UV coordinates, which may or may not be useful to you. It seems from your post that you need to learn the texturing stack in the material editor. From there, you can use a number of different image textures, and set them all to use your UV coordinates. 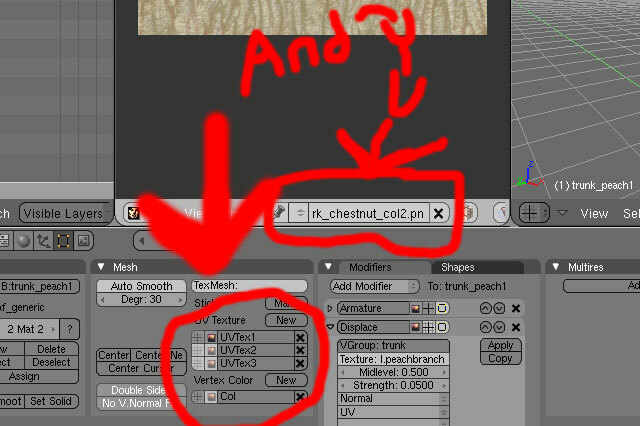 to add to what Harky said, you layer textures using texture channels, with each channel mapped to a UV Coordinate set (I agree UV Layer as a term is confusing). see wiki on Textures and channels. One use of the multiple UV maps is to remove seams in textures. Say your UV mapped texture has a mismatch where you had a seam in the arm. You would unwrap the arm with a second set of UV coordinates that has the seam in a different place. Now you bake the original texture to these new coordinates. The mismatch ends up not at the edges, but in the middle of the new image, where it’s easy to edit out in GIMP. This becomes your final, seamless texture. Someone wrote a nice tutorial on this a few months ago. I will try to find. Edit: The tutorial author is Cire. It is published in Blenderart Magazine, issue 12 which you will find here. Awesome. I think I’m starting to get somewhere with all this now. doing some of the things mentioned here and I’m seeing results. I just need to go read up on the links you posted here.